Often celebrated on this page is the thrill that comes from finding an Osaka woodblock print of a type wholly unanticipated. While riffling through a vendor’s bin at an old book fair earlier this year, my eye honed in on a small group of propaganda images glorifying some of Japan’s mid-20th century military adventures; specifically, the 1931 Manchurian Incident, the 1937 bombing of Nanking, and, yes, the fateful attack on Pearl Harbor in 1941. The attraction for me was both the medium — classically produced woodblock prints (moku-hanga) — and the publisher information in the margins, which indicated that all three works were Osakan in origin. Like most collectors, I am very familiar with the war prints (sensô-e) that ballyhooed Japan's first forays into modern empire-building. 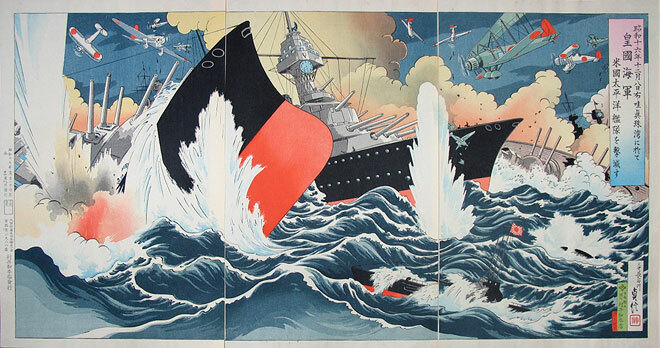 The home front was papered with triumphant scenes from the Sino-Japanese War (1894-95), and a bit later, on a far more selective basis due to competition from lithography and photography, the Russo-Japanese War (1904-05). However, almost all of these turn-of-the-century sensô-e — generally ôban triptychs — were published in Tokyo, the last place where commercial woodblock activity limped on. By the 1930’s, common sense suggested, no publisher anywhere would still be trying to disseminate propagandistic art with moku-hanga, when there existed cheaper, faster and more sophisticated imaging processes — technologies that were far more emblematic of a modern industrial power. What I had not reckoned with was the enduring Japanese love for woodblocks, an aspect of the culture so imbedded in the psyche that the tradition’s very persistence can serve a patriotic function. How else does one explain Fig 1, a classic ôban triptych produced in the old traditional manner? Published in Osaka in December 1942, it commemorates the first anniversary of what Imperial High Command called "Operation Hawaii"
Never mind the anachronistic biplanes (inspired by a poster for King Kong?) or the wacky ship's clock. * (Would showing a rational clock face on a US destroyer have violated the military secrets laws?) One need only focus for a second on the inaccurate placing of the battle in the open seas, plus the treatment of the waves, the torpedo plumes and the sinking ships, to imagine you are viewing a 1904 triptych of the Port Arthur campaign. The print’s designer was Sadanobu III (1881-1963), the then lineage holder of Osaka's most representative ukiyo-e family. Known for shin-hanga theatrical designs (Bunraku and Kabuki), plus conventional images of beauties and seasonal customs (viewable by the ream on eBay), Sadanobu may have been out of his depth with this assignment. His training would have left him unversed in contemporary aesthetics, let alone the visual vocabulary of Zero fighter strafing and dive bombing, and the best he could deliver was a retro-looking homage to his predecessors. On the other hand, perhaps the antiquated look was intentional, to satisfy the nostalgia of old-timers among the Osaka public. (I have yet to locate a WW II-era woodblock senso-e made in Tokyo.) Indeed, could there be any more effective way for a work of art to convey the promise of ultimate victory in the Pacific War than by graphically linking December 7th (actually 12/8 in Japan) to the ukiyo-e treatment of successful wars in the past? Assuming the Pearl Harbor print met public approval and numerous copies got distributed — a reasonable guess, given the strong subject and popular artist — why has it taken two decades of assiduous Osaka bin browsing to uncover a copy? And the same can be asked of the other prints in my little cache, not to mention "Where are all their sensô-e cousins?" US bombing raids undoubtedly led to the destruction of many wartime prints, and still others could have been "purged" from households during the Occupation, ultra-nationalist imagery being antithetical to the twin obsessions of cultural re-think and historical amnesia. Many, many, however, likely still rest in the bottom shelves of antiquarian shop chests. They await the coming to prominence — on both sides of the Pacific — of a generation of dealers and buyers for whom Zeroes and the USS Arizona carry no more emotional charge than a scene of Port Arthur. This article originally appeared in Daruma, no. 64, Autumn 2009. Copyrighted © text and pictures reprinted with permission. * Since publication of this article, the "clock" has been identified by Don Osmun (Ottawa, Ontario, Canada) as a range-finder for visually transmitting the distance of the "fall of shot." Once operators had determined how far previously fired shells had traveled, the hands on the 10-number dial could be adjusted to indicate how much companion vessels needed to adjust their ships' gun trajectories.